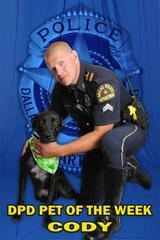 DPD's Pet of the Week is Cody A756579. Cody is such a goof! He's a big, energetic boy who loves to make faces and talk to his people. He's 2 years old and about 55 lbs, with a huge personality and heart to match. He has been in the care of Dallas Animal Services since July 1, 2015 when his owners moved into an apartment and were unable to take him. Cody is family ready - neutered, vaccinated, and microchipped. Let's help find Cody find a Furrever Home. You can meet Cody at Dallas Animal Services. He is available for adoption at Dallas Animal Services main location, 1818 N. Westmoreland, 75212. They are open 11 am to 6:30 pm Monday-Saturday and 12 noon until 5 pm on Sunday. Pictured with Cody is Senior Corporal Matthew Kobe who is assigned to the Mounted Unit.